Accountability For People: If a judge is entering a plea for you against your wishes what are the charges? 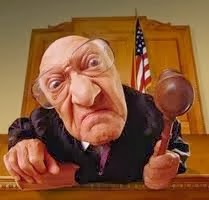 If a judge is entering a plea for you against your wishes what are the charges? 1. "is there evidence of a complaining party"? 2. "can you explain how all 3 elements of corpus delicti exist"? You only have 2 questions you need answered and the prosecutor will not answer your questions so the prosecutor although ordered to, still refuses to provide you with discussion and discovery. If the judge is NOT a criminal and corrupt tool in the pocket of central banks he or she will order the prosecutor to provide you with the requested discovery within 10 days and will dismiss the charges when they fail to do so, and they WILL fail to do so if there is no element of harm. If the judge however IS a corrupt tool of England (central banks) then they will attempt to enter a plea for you on your behalf usually of not guilty. if this happens you must object. "I object your honor, do you represent me"? This alone is usually enough to get them to back down. They hate being asked who they represent, because they represent the state as well as the prosecutor, which is a conflict of interests. They are an interested party in a case they preside over. The judge SHOULD allow you discussion and discovery, and if they DO NOT< they are violating your right to due process of law and committing a crime, if they talk about it with even the bailiff or prosecutor and agree to enter a plea for you they are committing another crime, CONSPIRACY AGAINST RIGHT 18 U.S.C .241. if the judge in any way attempts to imply any negative consequences for you asserting and exercising this right it is another crime under 18 U.S.C. 242 and because the violation of your right IS damage to property because your rights are literally your property, these are EACH 10 year charges. You can also file a claim and collect against this judge's bond". "YOU did not enter a plea, YOU cannot in good conscience stand under charges that do not at least have a complaining party and an alleged element of harm. To do so would be unAmerican and it is your duty to stand against such charges. You are correct, when the judge entered the plea the judge took the defendant's stand, and agreed to stand under the charges. The judge cannot possibly represent you he prepresents the State".